A series of photos have emerged from the ultra-secretive Abu Dhabi set of Star Wars: Episode VII and although none of the franchise’s big stars put in an appearance, the pictures offer some encouraging first signs of what fans can expect from the new movie. Director J.J. Abrams began shooting the highly anticipated film last month and while little is known about the script, the photos suggest a back to basics style to filming, shunning the unpopular CGI-heavy approach of George Lucas’ prequels. The photos reveal many encouraging signs for fans of the original trilogy. Abu Dhabi is believed to be a stand-in for the desert planet of Tatooine, Luke Skywalker’s home planet. Highlights from the collection of leaked photos, obtained by TMZ, include a massive four-legged alien creature that looks like a cross between a rhinoceros, a pig and a bulldog. 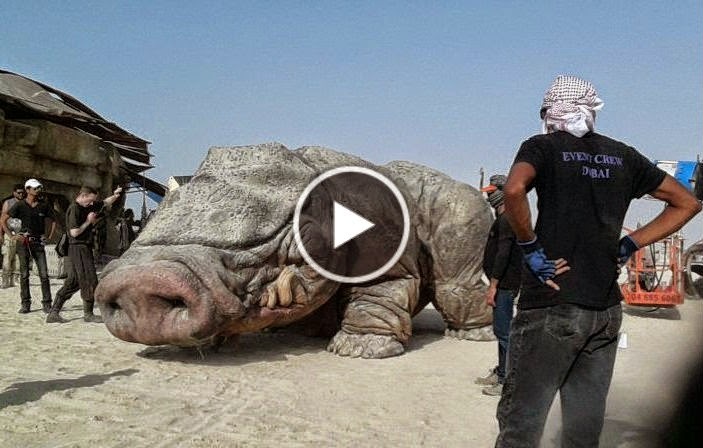 According to sources onset, the new alien is manned by five-man team inside its belly and is set to appear in two scenes taking place in what appears to be a market place on Tatooine. Another photo shows two busted robots, who bear a resemblance to R2D2, sitting in what could be the remnants of a pod-racer, popularized in the first episode of the prequel trilogy, The Phantom Menace. Bits and pieces of battered machinery and technology can be seen in the background of other photos, while extras dressed in a variety of muted colored costumes appear in other photos taking selfies. The impression made by the collection of photos is of a world eerily familiar to fans of the previous films, in particular Star Wars Episode IV: A New Hope when we are first introduced to Luke Skywalker. What should be especially exciting to a lot of fans of the original trilogy is the amount of practical effects that can be seen in the photos, rather than the all-green screen ‘sets’ of the prequel movies which proved unpopular with actors and audiences alike. A crew of 600 descended on Abu Dhabi last month and started to construct the sets on a site closely guarded by security services. Filming has since been completed in the desert and filming has moved to stages in London. Taking the production to Abu Dhabi marked a move away from the original desert locations used in the first six Star Wars installments. For Episodes I-VI, various spots in Tunisia were used to film most of the sandy scenes, including Tatooine. Additional footage was later shot in the Death Valley National Park. At the Tunisian government's request, the set for Anakin Skywalker's (Darth Vader) hometown in the Tatooine desert, Mos Espa, stil remains in the Sahara desert. Even if we are still a while away from official trailers and stills for Star Wars: Episode VII, these amazing photos are an opportunity for fans to grab a sneak peek at the planets and costumes being created for the next installment which is believed to be set 30 years after the battle of Yavin. In other Star Wars: Episode VII news, Lucasfilm has announced that Lupita Nyong’o and Gwendoline Christie have joined the cast. Nyong’o earned an academy award for best supporting actress this year for her breakthrough performance in 12 Years A Slave. Gwendoline Christie, currently starring in the hit television series Game of Thrones as Brienne of Tarth, has also been cast. She can next be seen in The Hunger Games: Mockingjay – Part 2. Star Wars' legends Harrison Ford (Han Solo), Carrie Fisher (Princess Leia), Mark Hamill (Luke Skywalker), Anthony Daniels (C3PO), Peter Mayhew (Chewbacca) and Kenny Baker (R2-D2) have all returned to the franchise, but Abrams has still made room for some fresh faces.